They are very suitable for temporary cooling: can be rented for short or long periods, during an outdoor event or the entire summer season. With Mobile evaporative outdoor coolers, you can guarantee fresh air where and when you want it. The whole range of evaporative outdoor coolers is available to hire with our fast and reliable rental service. The rental service for air coolers is particularly suitable for those looking for spot cooler or outdoor cooling solution flexible and want to enjoy a fixed fee, or for those who need only temporary and does not want to engage in the purchase of the cooling machine. Rent short term, even for short periods or for individual events. It is designed to meet the needs of our customers particularly short time couple of hours or days. Long term hire, Designed to meet the needs of every customer, it has a duration ranging from 1 to 12 months and is the right solution for those who want to use the equipment for evaporative cooling, both fixed and portable, with a fixed fee in time. Renting evaporative coolers with us can be designed according to the specific needs of each client. 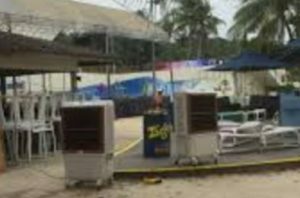 we offer outdoor coolers rental for cooling outdoor facilities or temporary cooling for outdoor events such as marquees, gazebos, parties, receptions etc. They can be rented for short or long periods, the duration of an event the entire summer season. If you also want to test outdoor air coolers before you buy can choose the alternative rental with purchase option. With the rental with a purchase option, you will test the natural coolness of the portable coolers throughout the summer and decide comfortably at the end of the rental period if you keep your cooler. Contact us and find the solution that best suits your needs!